Most people interested in self-development and personal growth have heard about SMART goal setting. And SMART goal setting is great. It helps you to get really clear about your goals and figure out exactly where you want to be at the end of whatever project you’re about to start. But there’s one problem with SMART goal setting. On its own, it won’t help you accomplish your goals. But you should still set SMART goals anyway. There’s just a few more steps that most people forget. As a quick reminder, SMART stands for Specific, Measurable, Relevant, and Time-bound. See this post for some examples of how this type of goal setting works. So while you should still set those SMART goals (preferably in writing), there’s a few other steps you need to take to ensure your goal setting actually works. Before you even start writing down those goals, ensure you’re very clear on your why. If you don’t know your priorities, your goals will be misguided. You might be chasing a promotion at work while ignoring your kids, or spending hours at the gym to get the “perfect body” and neglecting romance in your relationship. Or staying up all night to grow your business, and neglecting your health. 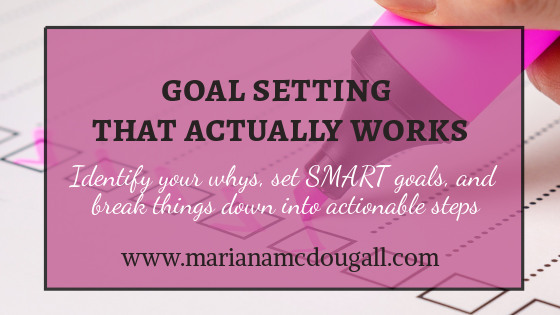 Once you’ve identified your whys/priorities, go ahead and set those SMART goals. But goal setting can’t end there. Once those goals are set, you’ll need to design a plan of action to actually accomplish them. That’s where a calendar, planner, or a day book can serve you well. Break your SMART outcome goal down into smaller goals, and break those smaller goals into actionable steps. So if, for example, your goal is to eat 5 servings of vegetables every day for a week, figure out what actionable steps you can take to ensure this happens. For me, that would involve setting a goal for one day in the coming week where I’d cut up veggies and put them in the fridge, ready to grab during the week ahead. You’ll need to figure out what those actionable steps will be for your own goals. But as you take those actionable steps and accomplish those smaller goals, you can feel confident that you’ll be able to accomplish that final, larger one. One final word of advice: ensure the goal you set is one you can have full control over achieving. For example, if you’re unemployed, “getting a job” may not be the best goal—you don’t have the final say in who hires you. But if your goal is “send 10 excellent job applications per day,” not only do you have full control over the goal you’ve set, you also have a better chance of getting a job offer. Just remember to break that initial goal into even smaller steps, too. Ready to get started with goal setting that actually works? Sign up for the mailing list and get a FREE goal setting worksheet to help you set SMART goals, break them down into actionable steps, and achieve them! Previous Previous post: Is Your Homeschooled Child Falling Behind?